Dear El + Em: Storefront Deals *Grand Opening* Giveaway! I've got fabulous news!!! In honor of the grand opening of Storefront Deals on August 1st, you have the chance to win an adorable custom address stamp! The custom address stamp has been donated by Whitney Rae Paper. 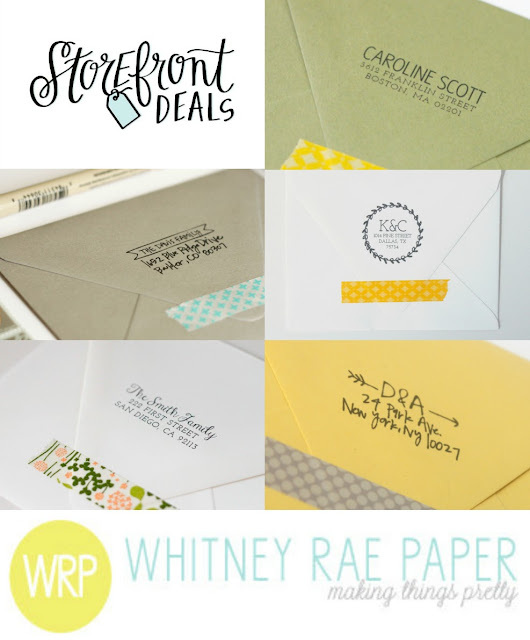 It's perfect for adding a special something to your outgoing mail. These also make great gifts - especially for a newly engaged couple, for a housewarming gift, and they even make great bridesmaid and hostess gifts. You have a week to enter, good luck!!! Sorry, Storefront Deals ships to US residents only. My favorite item is the Script Name Custom Address Stamp! I also love the Delight Yourself In The Lord poster! these are so cute... I love all of the designs for different reasons! I love her style--clean but chic. I'd love to have any! I'd also love to have any of the stamps! I love the stamps so much!!! The stamps are fantastic! The name stamps are great, would love to get one when we buy a home! They have some seriously awesome stamps! I love the arrows and the script. I don't know which one I'd pick right now. They're both so cute! I LOVE the address stamper!! My husband and I just got married so it would be so cool to have one of those!! I love the arrows and Pray without ceasing poster...such a cute shop! I absolutely love the Banner Custom Address Stamp - Self Inking and it would be perfect because I just moved! Love the self inking custom banner address stamp!